BSc., MSc. : U. Copenhagen; Ph. D.: James Cook University; Postdocs: Hofstra U., Johns Hopkins U., Brown U., Harvard U.
I am a senior working towards my Bachelor’s degree in Biology. Nature and animals have always been at the heart of my interest. Dr. Konow’s lab lets me explore and experiment within the field of biological movements in animals, to determine patterns and relationships between biomechanical processes. Currently, I focus on the chewing mechanism in rats, specifically, examining the force-length-activation dynamics of masseter, digastric, and pterygoid muscles. I assist with in vivo experiments during which a rat is monitored and fed foods of different hardness and toughness and I also assist with the subsequent in situ experiment. This project intrigues me because finding and understanding the mechanisms behind these patterns and relationships can be used to address issues regarding human health. My goal is to attend a graduate school where I can research ways to improve health and/or living conditions by means of biological engineering. As a freshman, Alex won a UML Co-op scholarship to work with Dr. Konow during the summer of 2016 at the Concord Field station. She studied the contractile behavior of the rat medial gastrocnemius and found that this hind limb muscle varies its length change trajectory during stance between uphill, level and downhill galloping, consistent with changing priorities on motor, spring and brake function respectively. 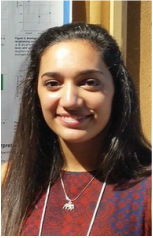 Alex presented her research poster at the 2016 UML Co-op research symposium and earned a stipend to bring an expanded version of her poster to the 2017 meeting for the Society of Integrative and Comparative Biology in New Orleans, LA. I am a freshman working towards a degree in Biology. I feel that Dr.Konow's lab is the best place for me because it has a lot of application to the biomedical field. I particularly find interest in the project on bone and muscle movements in the jaw of rats as they chew on food with varying hardness. In the future, I hope to gain a lot of insight on research and aspire to someday begin my own project in Dr.Konow's lab. I am a junior Biological Sciences major. Research is fascinating because you are contributing to new discoveries while also applying everything you have learned in the classroom. Dr. Konow’s lab was best for me because of different interesting projects he has pertaining to biomedical and evolutionary research. Carla is currently analyzing chewing EMG measurements from Axolotl cranial muscles. Clarice is a sophomore Biology major who won an Undergraduate Research Opportunities and Collaborations (UROC) award, which allowed her to join Dr. Konow’s lab during the summer of 2018. Her interests lie in organismal, ecological and evolutionary biology, She currently studies how coordinated movements of the jaw and tongue help control food position inside the mouth during chewing in various aquatic animals, including bichirs, axolotls and Amphiuma. I am a freshman pursuing a double major in Biology and Psychology. I moved from Mexico to the US in November of 2016 in order to attend UMass Lowell, where my father completed his postdoctoral study in entomology and taxonomy of fruit flies. I discovered my own passion for biology and specifically neuroscience during my last year of high school. Upon meeting with Dr. Konow, his fascinating comparative research immediately caught my attention. This lab is a great opportunity for me to expand my knowledge and learn ways in which I can apply this knowledge into practical research, while also preparing me for the future. I aspire to become a physician and specialize in neurology or psychiatry, targeting unattended populations in underdeveloped countries. I am a junior (Biology major) and an international student from Greater Noida, India. I aim to go to Harvard Medical School and become an excellent physician. I believe that research is an inseparable branch of medicine, and it is only due to this field that medicine exists. Before dreaming of being a doctor, I have always wanted to perform research and know the vast possibilities that science could provide to humanity. Dr. Konow introduced his research in my freshman seminar and I became interested in knowing more. I am excited to be in his lab as I want to learn about the basic techniques and experience its environment. Moreover, I wish to get a deeper knowledge of muscle physiology and biomechanics, handling datasets, using software, and writing scientific papers. Jacob is a computer science and English major who won an Honors stipend as a rising junior to work in the Konow lab. He is focused on creating a 3D digital reconstruction of lungfish and salamander chewing using X-ray Reconstruction of Moving Morphology (XROMM). His project seeks to unravel the potential contribution of elastic recoil to jaw adductor function as these groups chew. I study feeding (processing) in amphibians. I determine the framework conditions of processing in various salamanders combining contemporary 3D and classical ex vivo morphological studies with x-ray and high-speed kinematics. Integrating form, function and phylogeny, I strive to compile a theory of early tetrapod and caudate processing evolution. My cooperation with the KonowLab has opened up new possibilities including studying species indigenous to North America, learning new techniques, getting in touch with other scientists and access to scientific equipment at two universities. Most important, Dr. Konow continues to provide scientific input and is a source of inspiration for our publications. I am a PhD student from Simon Fraser University and my research focuses on examining the effects of muscle mass on contractile performance. As most of my research on this topic has involved building and using computational models of muscle, visiting the Konow Lab was a great opportunity for me to not only learn experimental techniques from researchers with extensive experience conducting animal experiments, but also to validate my muscle models and strengthen our understanding of muscle function. I am a PhD student in Dr. Doug Altshuler’s lab at the University of British Columbia. I am interested in biomechanics and muscle function, specifically relating to avian flight. Previously, I examined the function of one of the intrinsic wing muscles (the humerotriceps) of the pigeon using an in situ work loop approach. My visits to the Konow lab follow up on the results of this study. We use in vivo and in situ approaches to probe some of the questions that arose regarding the effects of whole muscle-tendon strain, tendon properties, and muscle activation patterns on the function of avian wing muscles. I graduated with honors in Biology from Knox College in Galesburg, Illinois where I studied fish feeding. For my honors thesis, I CT scanned 98% of North American minnow diversity to investigate the influence of phylogeny and diet on pharyngeal jaw structure. During my lab visit, I work on the feeding mechanics of aquatic salamanders. I plan to domy PhD in preparation for a teaching career. Trushti joined the lab motivated by the potential of our research to have a significant effect in the basic scientific as well as the biomedical world. For her Honors research project, she examined the movements of bones and muscles in the jaw and tongue of rats feeding on foods of varying hardness. In 2018, she gained entry to the New England School of Osteopathic Medicine, her first choice. Caitlyn is a freshman Psychology major who developed her love of biology from her father as she grew up surrounded by research in his lab. Her exposure to research intrigued her to begin her own research despite just starting college. Dr. Konow’s lab is perfect for Caitlyn to start her research because she is surrounded by peers who are always supportive and helpful. Caitlyn hopes to gain more research experience and eventually begin her own research project. Erica joined the lab in January 2017. A self-confessed "typical Biology student" she grew up catching and observing anything that moved. 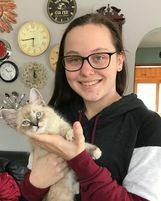 Currently a UML sophomore, Erika was spearheading care for our animals and also worked as animal caretaker in our department's main animal facility. 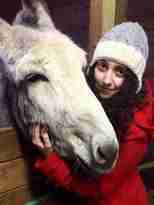 She left the lab to take up an internship at Andover Animal Hospital. I am currently a freshman pursuing my BSc in Biology. As a child, I was intrigued by evolution in regards to present day animals. Back in Africa, I’d sneak out of class and go to the science department just to feed the fishes, rats and birds. I was fascinated by these creatures and often wondered how they came about. Dr, Konow’s lab is ideal for me because his research on food processing and muscle-tendon function could help me better understand evolution and have a significant effect in finding cures to major human diseases. Someday, I hope to acquire more research experience and eventually begin my own research. Ben joined the lab with an interest in muscles of the hand and his current project seeks to measure in vivo force-velocity properties from finger flexors in humans that either have routine finger use, or exceptional finger training, such as for instance guitar players. Tim embarked on a Youtube-based study of chewing rhythmicity. He still watches animals chew on Youtube but is surrently a UML business major. As a sophomore biology major, during the summer of 2016, Jeff started working with Dr. Konow at the Concord field Station. He recalls this time as “an exciting and eye-opening experience for an undergraduate”. Jeff assisted with research on the rat medial gastrocnemius muscle and monitored vitals and anesthesia during isolated muscle procedures. He went on to work with Dr. Konow on x-ray based reconstruction of mandibular symphysis mechanics. Jeff’s other interests include video games, anime, and his dog Sophia (left), a beagle mix and the undisputed love of his life. Prior to Umass Lowell, Jeff attended North Andover High school (MA), where a sophomore anatomy class forged his interests in biology. After two UML years, Jeff moved to Merrimack Community College. As a freshman Biology major and a member of the Honors College at UMass Lowell, Victoria joined the Konow Lab to test out some of her research interests, including the evolution of tetrapods and the biomechanics of muscle mechanics, flight, and feeding. She is currently testing out other waters.